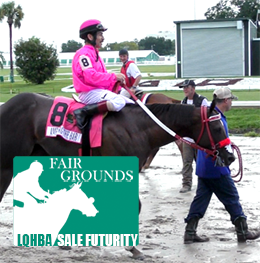 Amending The Bar after winning the record setting $434,538 LQHBA Sale Futurity(RG1) Saturday in New Orleans. NEW ORLEANS, LA—SEPTEMBER 8, 2018—StallioneSearch.com is in New Orleans, Louisiana to cover the running of the 2018 LQHBA Sales Futurity(RG1) from the Fair Grounds. This year's $434,538 purse for the LQHA Sale Futurity is the largest purse in history of the event. StallioneSearch.com was on hand to capture the 350-yard restricted-Grade 1 event, as well as to conduct a post-race interview with winning trainer Jose Sanchez III. He talks about the biggest win of his career with the Five Bar Cartel filly Amending The Bar, a $6,500 LQHBA Sale Futurity graduate who has earned more than $215,000 for owner Julio Ramirez. CLICK HERE to view the recap of the 2018 LQHBA Sales Futurity(RG1). Coverage of the LQHBA Sales Futurity(RG1) is sponsored in its entirety by the Louisiana Quarter Horse Breeders Association. Based out of Alexandria, Louisiana, the LQHBA successfully awarded over $4.26 in breeders awards to mare owners, and over $500,000 in stallion awards in 2017.